Gases in sea water reveal the ways in which a variety of physical, chemical, and biological processes interact in the oceans and coastal environments. A series of reactive trace gases found in sea water include methane, carbon monoxide, nitrous oxide, hydrogen sulfide, and hydrogen. These gases are both produced by and consumed by various types of organisms. The marine environment can be a source of these gases to the atmosphere. Atmospheric gases dissolve in sea water as individual molecules. The table lists the percentage of gases in air and in sea water equilibrated with air. At equilibrium a balance exists so there is no net gas transfer between the two phases. The percentage of gases in sea water is based on the total gases dissolved in sea water at equilibrium with air. 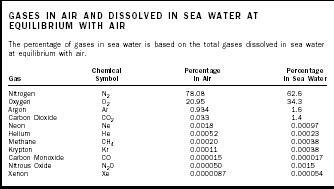 The percentages for a gas in air and in sea water differ due to each gas's characteristic solubility concentration. Gas solubilities vary with the temperature and salt content of sea water. Excluding water vapor, three gases make up 99.96 percent of air: nitrogen, oxygen, and argon. 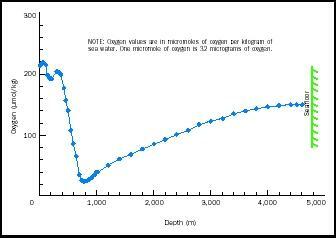 Compared to nitrogen, there are significantly greater amounts of oxygen and argon dissolved in equilibrated sea water. The noble gases helium, neon, argon, krypton, and xenon are chemically unreactive. Their concentrations in sea water result from a number of physical factors. Studies of noble gases in sea water show the importance of a process called air injection. When waves at the sea surface break or form whitecaps, small bubbles of air are forced into the water and can be mixed downward where the hydrostatic pressure causes their gases to dissolve and become supersaturated when compared with their solubility at atmospheric pressure. Surface sea water can be about 104 percent saturated with atmospheric gases owing to air injection. Oxygen is a very important gas in the ocean because of its role in biological processes. Marine plants such as phytoplankton , seaweed, and other types of algae produce organic matter from carbon dioxide and nutrients through photosynthesis , the process that produces oxygen. The upper 10 to 50 meters (33 to 164 feet) of the ocean can be highly supersaturated with oxygen owing to photosynthesis. Photosynthesis by plants is restricted to the upper sunlit areas of the ocean, but organic matter settles from the surface layer to deeper waters where oxygen consumption by animals and bacteria is a major process. The oxygen content of deep ocean waters is renewed by a process called thermohaline circulation. When surface waters either cool or become more saline (salty), their density increases and they sink to greater depths in the ocean where they can spread over vast distances. On a global scale, these dense waters form in the North Atlantic Ocean near Iceland and Greenland, as well as near Antarctica. The dense waters spread throughout all the oceans over periods of tens and hundreds of years, transporting high oxygen concentrations in the deep sea. The various processes affecting oxygen in the ocean are evident in its profile from the surface to the seafloor (see figure on page 79). Surface waters are high in oxygen due to exchange with the atmosphere and to photosynthesis. Oxygen content also is high in deep waters because of thermohaline circulation and the slow rates of oxygen consumption at those depths. The waters with the lowest concentrations of oxygen are often found at middepths of 200 to 2,000 meters (656 to 6,560 feet) beneath the surface in a region known as the oxygen minimum zone. Oxygen plays a very active role in the chemistry and biology of coastal waters, and its concentration is a major indicator of water quality. In many areas of the world, large quantities of nutrients enter coastal waters from agricultural fertilization and domestic wastes. These nutrients stimulate the rapid growth of phytoplankton. When the organic matter produced from these nutrients settles into the deeper waters of bays and estuaries , its decomposition can deplete the waters of oxygen. The result can be fish kills and the formation of hydrogen sulfide gas (H 2 S), which is poisonous to many types of organisms. Nitrogen is an essential nutrient required in the photosynthetic production of organic matter by marine plants. Nitrogen gas in the atmosphere and dissolved in sea water cannot be used, however, by many types of plants. Nitrogen must be converted into forms such as nitrate (NO 3 − ) or ammonia (NH 3 ) before it becomes a useful nutrient for most photosynthetic organisms. While the biological cycling of nitrogen is very important in the ocean, it has only a slight effect on the amount of nitrogen gas in sea water. Nitrogen in ocean waters is within 5 percent of equilibrium with the atmosphere. SEE ALSO Algal Blooms in the Ocean ; Carbon Dioxide in the Ocean and Atmosphere ; Life in Water ; Ocean Biogeochemistry ; Ocean Chemical Processes ; Plankton ; Sea Water, Physics and Chemistry of. Duxbury, Alyn C., and Alison Duxbury. An Introduction to the World's Oceans , 5th ed.Dubuque, IA: Wm. C. Brown Publishers, 1997. Pinet, Paul R. Invitation to Oceanography , 2nd ed. Boston, MA: Jones and Bartlett,1999. Is it possible that you could add a guide on how to make sea water chemically in the lab? This would be extremely helpful. Hi and can any one help with my research? I need to know what the gas layer on the surface of the sea is called? I am told that this layer helps prevent the sun vaporising the sea too quickly and that if it was not there we might have continued heavy rain five times what we normally get. I guess that somehow this gas layer (or whatever the layer is) holds down vapour to some extent and that this layer is about 3M to 6M thick. I also need to know how much more quickly the sun will vapourise sea water when the sea water is pumped as a fine mist above this layer, how much salt drops back into the sea and how pure the water would when the vapour was condensed back into water. 1. What happens if human intervention makes the Oxygen dissolved in sea more uniform than it is at present? 2. If additional ions of natural gases become available along the depths of oceans, how would oceanic water treat them?If it will assimilate them, would it mean that concentration of Nitrogen, Oxygen and Carbon dioxide shall increase all accross the depths of ocean.